The James brothers….well kind of. He’s Michael James, I’m James Hendley, but close enough. And of course you can tell from the photo, we were not just brothers, but identical twins. But I digress. This is where it all started. An unlikely friendship maybe, but one that has lasted the test of time. 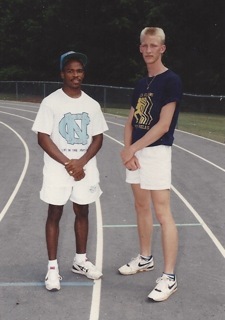 It began on the track of Harry P. Harding High School in Charlotte, NC. He was short and speedy, I was long and lengthy….not just in height but also in the time it took me to finish. But our friendship was not really built on the track, but during the periods of time we spent together in between those daily track and cross country practices. I drove so I gave Mike many rides home after practice in my stylish 1977 Lincoln Continental. It was about 150 feet long, and had a nice ding in the passenger side door that creaked very loudly when you opened it. Anyway, the car rides, the travel to and from meets, and hanging out in Coach Eaves’ trailer before practice, were the building blocks to a friendship that would last well into our 40’s and create a strong bond that is common among coaches and athletes. We both attended UNC where we were also roommates for a semester. That is where Mike introduced me to Prince and the Revolution. I have never been the same since. After that we lost our connection as I traveled around the world with the Navy, until Facebook allowed us to finally reconnect. In 2011, Mike asked me if I would be his coach while he trained for ultra races. I was deeply humbled but immediately agreed. Now we are on this adventure together. He runs, I coach. I do triathlons, he cheers. He shares his secrets, I try them out myself. Together we push through boundaries we didn’t know existed. That, is how it all began.